Sie waren unbestritten das Female Metal Flaggschiff Brasiliens. International gesehen konnten sie mit so mancher bekannteren All Girl Band mithalten. 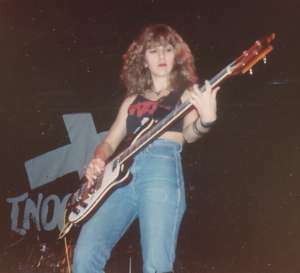 Mitte der 80er Jahre gründeten Gitarristin Karla Carneiro und Basserin Mila Menezes mit einigen Mitstreiterinnen ihre Band. Der Rest des Line up wechselte ständig, vor allem die Stelle der Drummerin war immer ein grosses Problem. Ihr Demo 1988 spielen sie noch mit einem Mädel an den Drumms ein, ehe sie wohl das Theater satt haben, und Segio Facci von den gerade aufgelösten VODU holen. Mit ihm zusammen nehmen sie 1991 ihre erste Scheibe auf, die guten Thrash mit einigen leichten Punk Einflüssen enthält (eine CD Version dazu erschien nur in den USA, mit anderem Cover). Dann haben sie wieder einige interne Probleme. Sängerin Marielle verlässt die Band, und mit der neuen Claudia Franca, und einer zweiten Gitarristin Namens Selma Moreira können sie erst 1994 ihr zweites Album aufnehmen. Hier sind die Punk Einsprengsel ganz verschwunden, aber ihr Thrash wird etwas härter, mit leichten modernen 90er Einflüssen. Sie waren auch einige Male im TV. Gitarristin Selma lebt heute in der USA. Im Jahre 2002 kam dann einer der vielen Bootlegger in Brasilien auf die Idee, das alte 2 Track Demo, zusammen mit einem Demo der anderen Mädchenband FLAMMEA, auf eine Vinyl LP herauszubringen!! 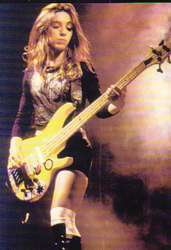 They were without doubt the leaders of the female Metal in Brazil. On international level they could compete with a lot of much more known all girl bands in other countries. They were founded in 1987 in the capital Brasilia from Mila Menzes (b), Karla Carneiro (g), Ana (d) and Eliane (v). The last two did not stay long, and Marielle Loyola (v), and Debora (d) joined. They came from the bands DETRITO FEDERAL and ARTE NO ESCURO. 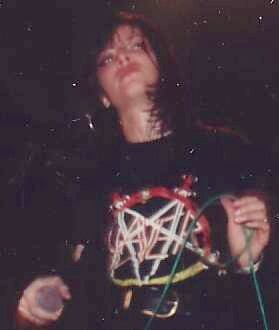 All together moved to Sao Paulo and recorded in 1988 the first 2 track demo "Thrash flowers". This made the band known, and they could record their first album in 1990 (genius named "First"). Before the recording the problems to find a drummer were very serious. Debora left the band, and Pat from OZONE was drumming for a short time. For the record they hired the guy Sergio Facci from the just split band VODU. He is not on the band pictures, and was may be at this time not considered a full band member. But they could not find a female drummer, so he became a full member. The music on the record is Thrash with slightly Punk influences. There is no CD version of this album in Brazil, but there was one in the US from "Moving targets records" with different cover. This shows already that the band became widely known. But still there were problems. 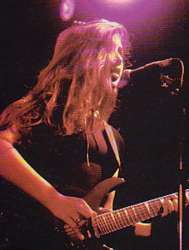 Singer Marielle left the band and Claudia Franca came, and there was also Selma Moreira hired as a second guitarist. In the second album "Mindtrips" in 1994 they played more extreme Thrash with some slight 90s influences. Some years after that the band split up. There seems to be no one of the girls active anymore, only Selma moved to the US and people say, that she is still playing. The girls also played several times in TV. 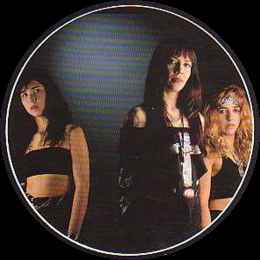 In the year of 2002 one of the many bootleggers in Brazil had the idea to release the old 2 track demo of VOLKANA, together with a demo of the other all female band FLAMMEA, on a vinyl LP! The sound of it is o.k., and the quantity of the pressing seems to be very small! Elas foram com certeza as líderes do Metal feminino no Brasil. Num nível internacional elas poderiam competir com diversas outras bandas femininas de outros países. 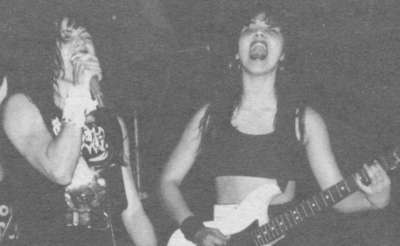 Elas, Mila Menezes (b), Karla Carneiro (g), Ana (d) e Eliane (v), fundaram a banda em 1987 na capital do país, Brasília. Ana e Eliane não permaneceram por muito tempo sendo substituídas por Mariele Loyola (v) e Débora (d) vindas das bandas DETRITO FEDERAL e ARTE NO ESCURO. Todas se mudaram para São Paulo e gravaram, em 1982, uma demo de 2 faixas, "Thrash Flowers". Esta demo fez a banda ser conhecida e com isso puderam gravar seu primeiro álbum em 1990 (genialmente nomeado de "First"). Antes de gravar tiveram sérios problemas em encontrar uma baterista. Débora deixou a banda e Pat do OZONE esteve na bateria por um curto período. Para a gravação, elas chamaram Sérgio Facci da recém acabada banda, VODU. Ele não está nas fotos da banda por não ser considerado mebro da banda neste período. 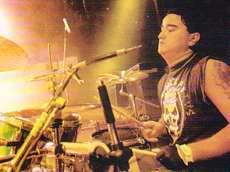 Como não conseguiram encontrar uma baterista, ele acabou se tornando membro oficial da banda. A música neste disco é Thrash com sutis influências de Punk. Não há versão em CD deste álbum no Brasil, mas houve uma versão americana, com cover diferente, da gravadora "Moving Targets". Isto mostrava que a banda já estava se tornando conhecida, mas ainda existiam problemas. 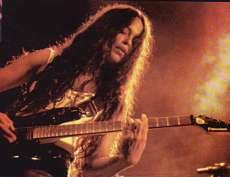 A vocalista Mariele deixou a banda, sendo substituída por Cláudia Franca e uma segunda guitarrista jntou-se à banda, Selma Moreira. No segundo álbum "Mindtrips" de 1994, elas tocam um Thrash mais extremo com algumas inflências dos anos 90. Alguns anos depois a banda acabou. Parece que nenhuma das garotas estão em atividade, somente a Selma que se mudou para os EUA e, dizem, ainda está tocando. As garotas também tocaram muitas vezes na TV. No ano de 2002 um dos muitos pirateiros no Brasil teve a idéia de relançar as 2 faixas da demo do Volkana junto com a demo de outra banda feminina, FLAMMEA num LP! O som é ok e a quantidade de cópias prensadas parece ser bem pequena! !